Dijon is a city in the Bourgogne region in France. As of 2005, the city had an estimated population of 150,800, and the metropolitan area of Greater Dijon had an estimated population of 236,953. Dijon is, of course, internationally famous for Dijon mustard (French: moutarde de Dijon), although nowadays almost all mustard seeds are imported (mainly from Canada) rather than grown locally. Additionally, most "Dijon mustard" is now produced on an industrial scale, and not necessarily in the vicinity of the city. However, if you do visit Dijon, you will find that there are mustard shops in the city, and they offer a range of mustard varieties, including varieties with unusual flavorings (for example: fruit flavorings), and often sell this mustard in decorative hand-painted china pots. Dijon is a city in the Bourgogne region in France. As of 2005, Dijon had an estimated population of 150,800, and the metropolitan area of Greater Dijon had an estimated population of 236,953. Dijon was originally founded as a Roman settlement called Divio. 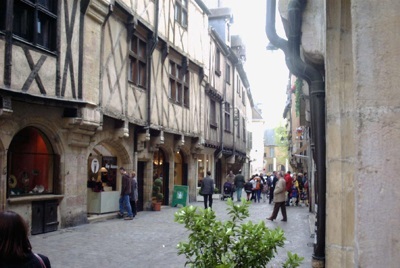 Dijon was the home of the Dukes of Burgundy from the early 11th century until late in the 15th century. Dijon is famous as being the source of Dijon mustard (French: moutarde de Dijon). Today however, almost the mustard seeds used in making are imported, rather than grown locally. Nevertheless, if you visit Dijon, you will find numerous shops selling Dijon mustard, including unusually flavored varieties, and mustard sold in decorative containers. Crème de cassis, a type of blackcurrant liqueur originates from Dijon. Crème de cassis is most frequently drank in the form of a cocktail named "Kir" (named after a former mayor of Dijon, canon Félix Kir), which is made from a mixture of white wine and the liqueur. Readers will be interested to know that Kir is the favourite drink of Agatha Christie's fictional detective, Hercule Poirot. Each year, an International and Gastronomic fair is held in Dijon. This fair, which is one of the top ten fairs in France, has around 500 exhibitors, and attracts around 200,000 visitors each year. Approximately every three years (although there are sometimes variations), an international flower show ("Florissimo") is held in Dijon. Exhibitors include French and international cities, botanical gardens, agricultural schools, and corporations. Are you planning your next vacation abroad and you’re ready to explore? Do you want to be prepared for everything? Are you ready to experience every new place you visit just like a local? Well, with this amazing Dijon (France) travel map you’re all set and ready to go! The Dijon (France) map was carefully designed to give you amazing results and make traveling easier than ever. We make sure to constantly update our info to give you the most relevant and accurate information, so you will never get confused or frustrated during your Dijon (France) trip. The map is very detailed and it will not only give you all the available roads and routes, but also the essential information to make your Dijon (France) vacation unforgettable. In the Dijon (France) map you will also find the best places to go shopping, the most famous and must-see sights, churches and more. The author arrived in Dijom, France in 1929, young, new to Europe, new to France, new to marriage, new to cookery. Her experiences there put her on the way to becoming of the world's most celebrated writers on food. In this book we read about her growing up in the old city of Dijon, to learning to understand French, to understand French ways and prejudices. This stunning Dijon (France) travel journal is the most essential accessory for every travel and adventure lover, as it will help you express yourself and get lost into this whirlwind of new destinations. Take a look at the Dijon (France) map, find your way towards adventure and lose yourself to unknown destinations because you only live once, so why not live your life to the fullest? In the Dijon (France) map you can see all the available means of transport, bus stops and routes so you can always know how to get everywhere. And because we know that a vacation is not only about the roads and busses, the map gives you many options for eating, drinking and having a good time! We carefully marked all the restaurants, bars and pubs so you can always find one that is nearby. In the Dijon (France) map you will also find the best places to go shopping, the most famous and must-see sights, churches and more. And if an emergency comes up, there are markings of police stations and hospitals everywhere for your convenience. So what are you waiting for? Pack your bags, get your Dijon (France) map and let’s get started! In 1929, a newly married M.F.K. Fisher said goodbye to a milquetoast American culinary upbringing and sailed with her husband to Dijon, where she tasted real French cooking for the first time. The Gastronomical Me is a chronicle of her passionate embrace of a whole new way of eating, drinking, and celebrating the senses. As she recounts memorable meals shared with an assortment of eccentric and fascinating characters, set against a backdrop of mounting pre-war tensions, we witness the formation not only of her taste but of her character and her prodigious talent.